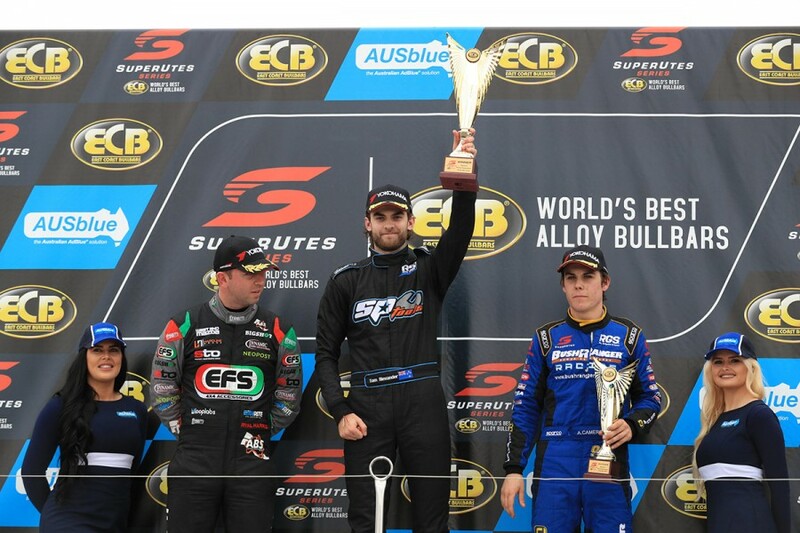 Tom Alexander has taken out the Winton round of the ECB SuperUtes Series with a commanding victory in the third and final race of the weekend. The Ross Stone Racing driver took an early lead, having beaten polesitter Aaron Cameron to Winton's first corner, ultimately finishing 2.0406 seconds clear of Ryal Harris. Alexander seized his opportunity to sneak past after the Mazda of Cameron was slow away at the rolling start, with a move that claimed Alexander his third SuperUtes win. “I managed to get the jump on Aaron off the line, but I had a bit of a moment on the exit of Turn 2 which allowed him to get back alongside,” Alexander told Supercars.com. Having won the opener and finished ninth in Race 2 after a penalty, it was enough for Alexander to win Round 2. “Race 2 was my first time racing in a pack of Utes and the field slowed down more than I expected into Turn 7; unfortunately Toby [Price] was the innocent bystander and I turned him around,” he said. “The drive-through hurt us a bit but luckily, Race 2 is only worth half points so it wasn’t as costly as it might have been. Mazda driver Harris was quick to move up, edging past Cameron on the opening lap and bringing his EFS 4x4 Racing BT-50 home second for the race and round. “The power steering died in that race, and these things are not very easy to drive with no power steering!” Harris said. Bushranger Racing's Cameron then dropped to third, before Toby Price moved past the Mazda in his factory-backed Mitsubishi Triton on the fifth lap. Dakar Rally winner Price finished third ahead of Cameron, who eventually took fourth in the race and third for the round. “I missed a gear coming out of Turn 12, which allowed Toby past – I was kicking myself, because it cost me second for the round,” Cameron said. Price added: “Everything clicked for me in that race, it was the best I had driven all weekend. Western Sydney Motorsport's Craig Woods and Team 18's Thomas Gasperak occupied the next two spots. After two rounds in the inaugural series, Woods leads the championship, sitting four points ahead of Harris, while Price, Cameron, MacKelden and Alexander complete the top six. “Realistically, we didn’t have the pace to run at the front this weekend, so I’m stoked to still be leading the championship,” Woods said. Toyota pair Ben Walsh and Matthew MacKelden were seventh and eighth, followed by Stephen Wilson in the Isuzu D-MAX. Christopher Formosa rounded out the top 10, battling mechanical issues all weekend in the Allgate Ford Ranger. Craig Dontas retired from the race, venturing back into the pits at the end of the second lap with engine temps rising in his factory-backed Mitusbishi Triton. The third round of the ECB SuperUtes Series will take place on the streets of Townsville on July 6-8 as part of the Watpac Townsville 400.